Before I quit my office-slave job, I worked across the street from David Letterman's studio. For over two years. 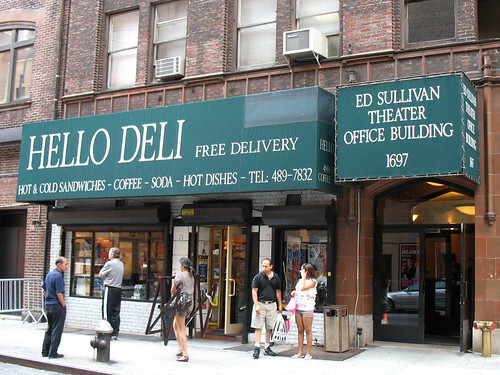 But it was not until my last week of work that I finally visited the famous Hello Deli. I felt like such a frakking tourist taking this photo! I walked in with the intention of getting some kind of grilled vegetable sandwich... but as I was scanning the section of the menu labeled "Vegetarian", the woman behind the counter enthusiastically offered her suggestion: "My favorite is the garden burger". I had not expected to find a burger here, but how could I say no, especially when it was offered with such a glowing recommendation? While my order was prepared, we talked about the importance of a good veggie burger, and the best vegetarian restaurants in the city. I promised I would come back to give her my critique of the garden burger after I tried it. I also witnessed a steady stream of tourists coming into the deli while I waited. One young man stood very quietly just looking around for a few minutes until he finally said to the man behind the counter "Can I just shake your hand? You're famous, you know! You are Rupert, right?". Two more tourists came in and eagerly announced their presence before I left. I'm going to call burgers served on toast "deli style" burgers from now on. This one was on whole-grain bread, toasted to a perfect crisp, and spread with mayo on one side and pesto on the other. Pesto is one of my favorite things in the world, and I think I've only seen one other burger thus far that incorporated it. Plus avocado, also perfect. 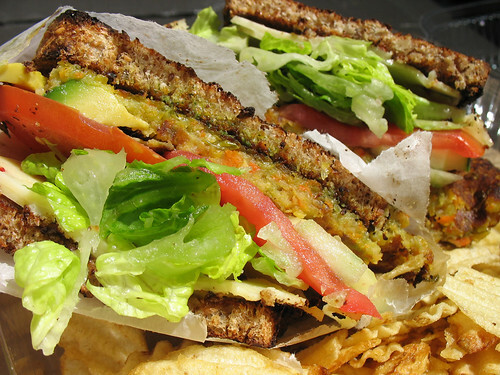 And lettuce, tomato, cucumber, and carrot slices. With melted pepperjack cheese. 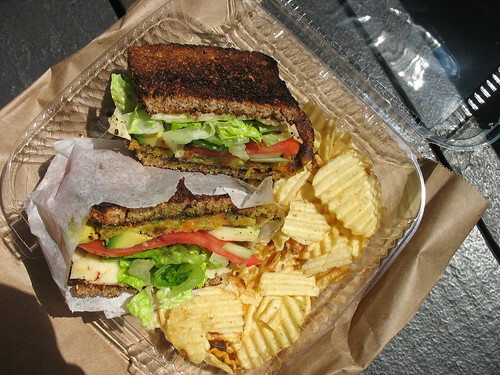 Since it is a deli though, and they are used to doing made-to-order sandwiches, it would be easy order the garden burger without cheese or mayo if you wanted it vegan. Served with a side of potato chips. The woman had told me "I confess, we don't make it ourselves, but we tried lots of different ones and picked the best" when I asked her if the patty itself was made in-house. It was quite good for a pre-made patty. Lots of bits of chopped up vegetables, with a crispy grilled outside. It actually reminded me of the patties I buy from Costco. I have to just state once more how delicious the pesto was. It was truly the secret ingredient that made this burger so amazing. I feel torn between calling it a sandwich or a burger. I have a hangup about buns. I've had this problem since the very first post on this blog. Is it still a burger if it’s not served in a bun? I tend to go by what the menu calls it, so if they say it’s a burger, then it must be a burger… But either way, it was a delicious lunch. Haha, burgers on toast! I'm glad to have helped inaugurate a trend, I suppose.